I’ve been thinking for a while now about adding different breeds of wool to my Etsy shop staples. The last time I dyed, I ran out of BFL. 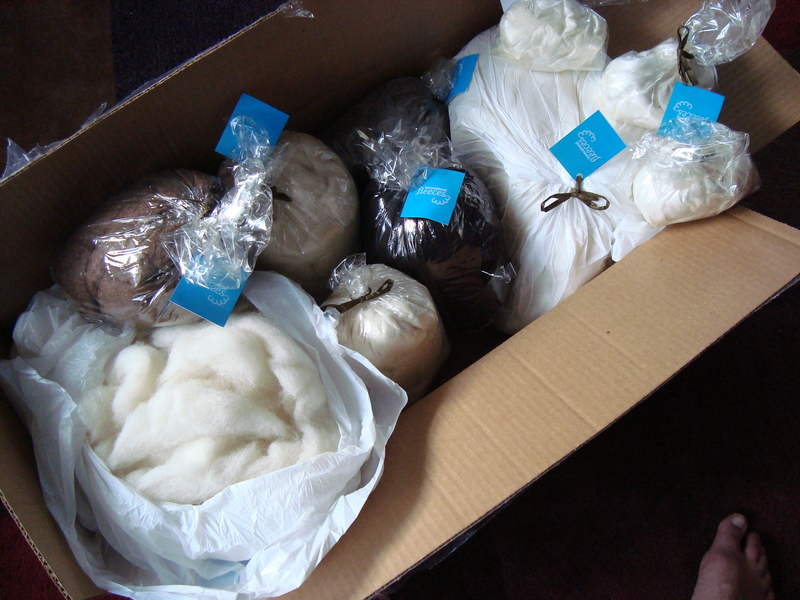 And that means that it’s time to place a new order for fibers to dye. And so I’ve been pondering: what other fibers to add? I am loving the Polwarth that I just dyed up. I made it through the first 4 ounces of the spinning, and it is turning into the lightest, loftiest fiber I could have imagined. I’m trying to spin a laceweight, but I’m not sure I’m going to make it, just because the wool is so fluffy. So that’s on the consideration list. Last weekend, Ellen casually asked in an email whether I’d ever considered dyeing rare wools. Why yes, I have, but I’ve just never gotten around to it. Actually, I haven’t even gotten to trying them out in the first place. Her question (and recent experiments, here, here, and here) moved this up the priority list in a hurry. Clearly, some research was needed. These are all fairly small quantities, with the exception of a pound each of Whitefaced Woodland, Portland, and Cheviot. In smaller samples, I have Manx Loaghtan, Black Welsh Mountain, and Norwegian Top. And then there are a couple of exotics, too: Banana Viscose, Soybean silk, and Ramie. Lots of things to play with! Do you have a favorite fiber to spin? Are there others that I absolutely must try? More experiments! Some of those I don’t think I’ve even heard of. I’m no help as to favorite fibers to spin, I’m afraid…. But it looks like you’ll have plenty of spinning fun even without my input! I’ll be interested in hearing your thoughts on the Manx Loaghton. The roving I had was nasty (no fault of IF, their other stuff has been fabulous) and I needed to comb it out. It then turned into pretty decent stuff and that color is hard to find in other breeds. Actually, I’m interested to hear what you think of all of them! You can look at my stash page for notes on some of the breeds I haven’t discussed much on the blog. And look in the Rav group “Spin Doctor” in the Rare Breed Challenge thread for more notes on lots of breeds. Hmmm, I’d better go buy more of that White Faced Woodland roving right now, before it goes out of stock. That was just sheer fun to spin woolen. Have fun with it! Ooh! I was inspired by Ellen, too, but you’ve moved faster than I have. I’m dying to try some Cheviot (don’t know why, it’s just on my list). But first, I’m working my way towards the gorgeous Kestrel fiber – can I just tell you that you nailed that one right on the head? It’s exactly what it should be, right down to the red-y browns that are so hard to find – thank you!! My problem now is fear that I’ll ruin it somehow – I need to figure out how I want to spin this, whether I want to preserve the color changes, or let them mingle, or…? Rambouillet. You’ll love it! And Wensleydale for a long wool. DesigKnit is powered by	WordPress 4.8.9 . Page generated in 0.274 seconds using 34 queries.